The food is art, the flowers are food and the chefs really, really like working there. 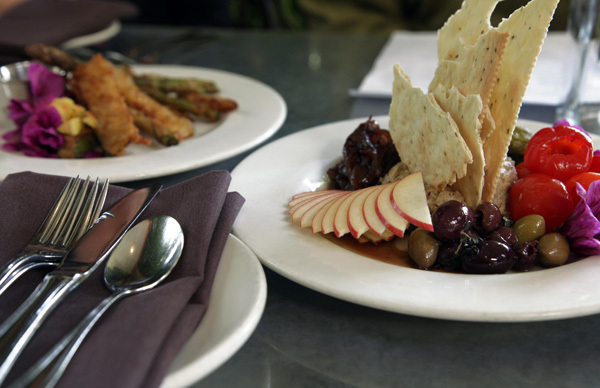 How do you choose the best items on one of the best vegetarian menus in town? I’d say, ask someone who has been cooking there for 20 years. It worked out pretty well for me. Cafe Flora has been a longtime favorite brunch spot of mine – beignets and cinnamon rolls to wet your pallet? I thought you’d never ask. But I’m not here to talk about brunch. I’m here to talk about post-cinnamon roll meals and the creative mind behind the gravies, pâtés, French dips and brownie sundaes that make vegans swoon. 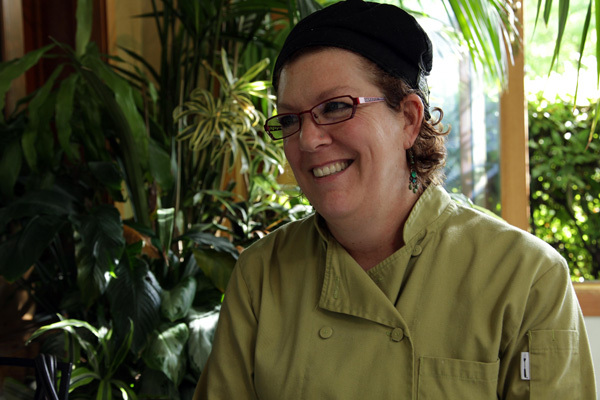 This spring marks Executive Chef Janine Doran’s 20th year at Cafe Flora. Now let’s just stop for a minute and think about that one. 20. Years. 20 years! Maybe it’s the fact that she gets to constantly change the menu, maybe it’s the amazing partnerships they have developed with local farmers or the collaboration and respect that’s so evident among all co-workers. And let’s be honest, maybe it’s the cinnamon rolls. It’s probably the cinnamon rolls. Doran described working at Cafe Flora with so much excitement and pride, you’d think she just started last month. And it was refreshing to hear that she loves cooking meatless simply because, “vegetarian food is some of the best tasting food in the world.” Here are a few of Chef Doran’s favorite items on the menu. If you don’t know how I feel about beer-battered things, you probably just figured it out by reading the first part of this sentence. You could beer batter a shoe and I’d find a way to eat it. But these vegetables are not shoes. And this is not just any ol’ beer-battered, mouth-watering, day-making dish. It’s better. 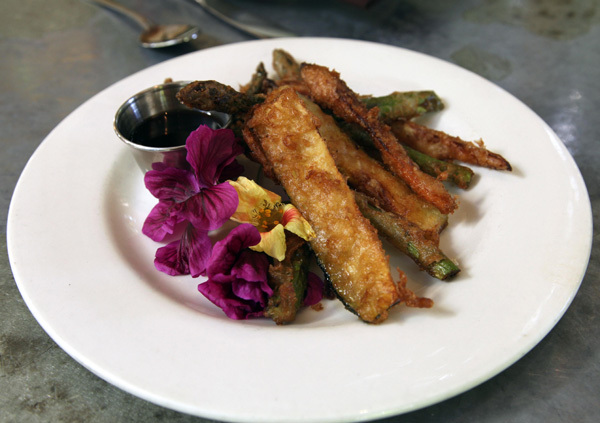 Asparagus, carrots and zucchini straight from the farmer’s market are battered and fried to crispy perfection. Ginger gives the crunchy exterior a nice, mild kick, and the tamari yuzu sauce adds a tangy spark I would have never thought to pair with beer-battered anything. But it works. Oh yes it does. I lurve this dish. Look at this dish, just look at it! It’s beautiful. Part of me wanted to take the whole plate home and hang it on my wall. But that part of me was also pretty hungry, so I just ate it. But I really, really appreciated its beauty while doing so. I promise. With dozens of combinations all creating their own unique flavors and textures – this dish is like a grown up version of the syrup caddie at iHop (best invention ever). It’s a fun adventure of mix and match where every outcome ends in you wanting more. Somehow, at some point, someone decided that by simply adding fruit and vinegar to lettuce, you had a fancy salad that everyone would love. Well, I detest that person. Because it ain’t that easy, and I can’t count how many salads I have ordered expecting something delicious and receiving something I would classify as nearly inedible. 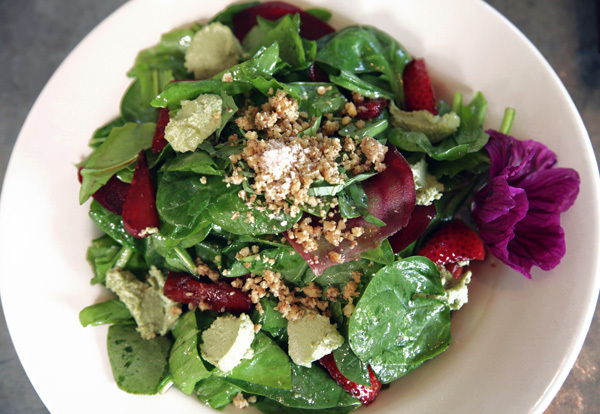 To all you “salad” makers, I encourage you to stop by Cafe Flora to try the Strawberry and Sorel salad. That’s the way a salad should taste. Fresh ingredients, homemade dressing and cashew cheese! EVERYONE GO TRY THE CASHEW CHEESE. It’s fantastic. And mixed with the balsamic-soaked strawberries? It lead to some pretty inappropriate food moans. Ya hear that? Food moans over a salad! This hearty, fake-meat-free sandwich was one of Chef Doran’s first creations at Cafe Flora, and it has lived happily on the menu ever since. I have a feeling if they ever decided to remove it, they might get a few dozen angry letters. Or a few hundred. Or some bricks smashed through their atrium window. This sandwich is crazy good. 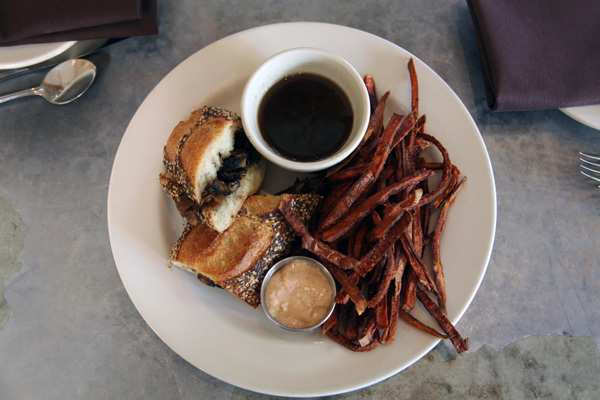 Thinly sliced mushrooms and onions piled on my favorite bread of all time, the seeded baguette from Columbia City Bakery, first dipped in spicy mayo and then mushroom jus? I’d smash a window for that. I have come to the conclusion that they straight up lied to me about this dish. 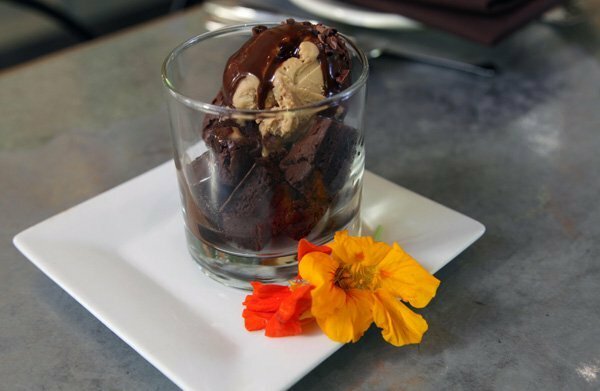 There is no way a vegan, gluten-free brownie can taste so… not vegan and gluten free. Well, I guess there is one way. It includes a precise mixture of five different gluten-free flours, Theo dark chocolate and an incredible pastry chef devoting much of her life to making sweet tooths smile. Thank you pastry chef, your vegan magic made my day. Cafe Flora struck gold with Chef Doran. And Chef Doran clearly sees something special in Cafe Flora. It’s hard to pin point the one thing that keeps her around, but this is what I noticed: after sitting around the table for just ten minutes with chef Doran and owner, Nat Stratton-Clarke, I felt like I was a part of the family. And I can imagine anyone who has worked there for more than 10 minutes probably feels the same way times a million. Cafe Flora is filled with talented chefs who get to be creative, resourceful and innovative when developing the menu, and that’s worth a couple billion points, or 20 years of work, in my eyes. My Floral Flora Tip: Eat the flowers! They’re not just there for show, they’re for your mouth! Posted in Uncategorized and tagged Cafe Flora, Janin Doran, Josie James Keeney, Meatless Mondays, vegan. Bookmark the permalink.